The AWA L1.1 jacket is conceived for those ladies who don’t want to go unnoticed, wheter on the ski slopes or in everyday life. The next generation of AWA Ladies brings back the the layering concept but with a new look, that is more style oriented. The outer shell is made with D-DRY+, a high performance membrane capable to resist to treacherous weather conditions while the precious baby camel wool padding of the inner jacket provides great insulation to protect the wearer from coldest days. 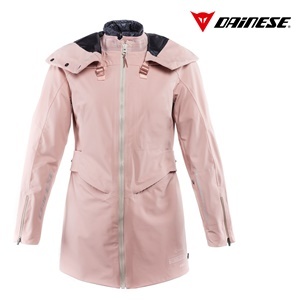 Finally, the long, slim- fit cut, the cape-style hood and numerous other fine details make this new garment the hallmark of all that is feminine and elegant in the Dainese collection.